3.5 or 4.... I can't decide. 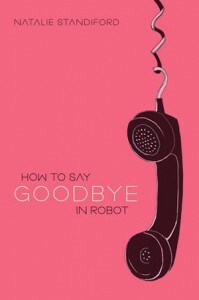 Nor am I sure how to review this book - it's as if there was a mash-up of Eleanor & Park, Jessica Darling/Sloppy Firsts, and threw in a pinch of Saving Francesca, and you would have How to Say Goodbye in Robot. There's a pair of outsiders who don't feel like they belong until they find each other, there's witty banter & sweetness combined. There's bumbling through a first relationship, there's lot of innocence & friendship, a smattering of jealousy, and equal amounts of heartbreak & hope. There's parents mucking through their own dramas - oblivious to what's going on in their children's lives. Secrets are held and finally revealed, and all of it unfolds in Standiford's clear unique voice. I loved Bea, wanted to throttle Jonah (and esp his dad), and I rooted for Walt. I loved the quirky but wanted Bea to have more drive to figure out what was going on with her mother. I wanted to see her stand up to Jonah and call him on his BS. Some things didn't add up in retrospect & needed to be more thoroughly fleshed out, but all in all it was a lovely read. I'm wondering if there will be a sequel after that nice-but-also-open-ended ending.